Bestselling CompTIA A+ author Mike Meyers provides hands-on, step-by-step labs--updated for the 2012 release of Exam 220-802--so you can practice the IT skills essential for your success Mike Meyers' CompTIA A+ Guide to Managing and Troubleshooting Operating Systems Lab Manual, Fourth Edition contains more than 25 labs that challenge you to solve real-world problems with key concepts. 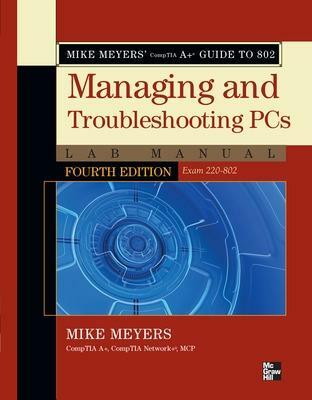 Clear, measurable lab objectives map to certification exam objectives, ensuring direct correspondence to Mike Meyers' CompTIA A+ Guide to Managing and Troubleshooting Operating Systems, Fourth Edition. The Lab Manual also includes materials lists and lab set-up instructions. Step-by-step, not click-by click, lab scenarios require you to think critically, and Hint and Warning icons guide you through potentially tricky situations. Post-lab observation questions measure your understanding of lab results and the key term quiz helps to build your vocabulary. Michael Meyers, MCP, CompTIA A+, CompTIA Network+, CompTIA Security+ (Houston, TX), is one of the industry's leading authorities on CompTIA certification. He is the president and founder and Total Seminars, LLC, a major provider of PC and network repair seminars for thousands of organizations including IBM, Lucent Technologies, GE, the FBI, the FAA and the United Nations. Mike is the best-selling author of the A+ Certification All-in-One Exam Guide.